Even though it seems that the majority of brides still opt for traditional white wedding gowns, the truth is that these are a bit outdated these days, when there are so many possibilities and different options that include a lot of different shades – and no, we don’t think about beige or ivory! It’s time to break up with tradition when it comes to this aspect, so be sure to choose a wedding gown in your favorite bright shade if you want to stand out from the rest of the brides at all costs. Hot pink, bright yellow, fiery orange, emerald green, and turquoise blue are fantastic choices because these colors are extremely trendy this year. On the other hand, you can also pick any pastel shade you like – from millennial pink and powder blue to mint green and pastel lavender. You won’t make a mistake whichever you pick! One of the best ways to create a memorable wedding day everyone will be happy to talk about is coming up with unusual decorations, so be sure to find some original ideas online and see what you can do to make that happen. As you may already know, wedding arches have always been a huge hit when it comes to weddings – both traditional and modern – so you should design one for your own big day. 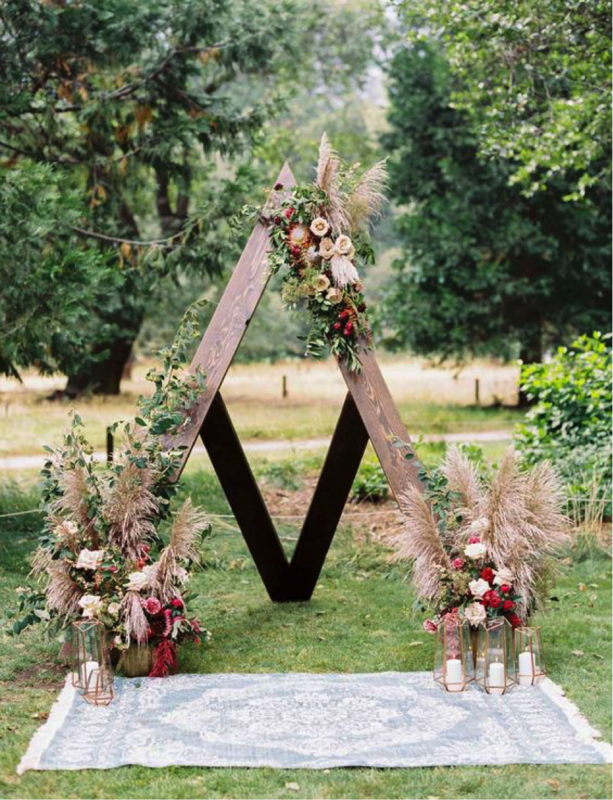 However, your arch should definitely be designed with a twist if you want to be authentic, so come up with a triangle wedding arch and you’ll certainly nail this task like a real pro. These are particularly appropriate if you’re planning a boho wedding, so pick a wooden triangle arch, decorate it with freshly picked flowers, greenery, and foliage, and voila – your unusual wedding decoration is all done! Weddings that take place at some exotic destinations have always been considered unconventional, but not in a bad way, of course. These are really special as the bride and the groom usually invite a limited number of guests to the ceremony, which is exactly what makes them so fabulous and memorable. Beach weddings somewhere in Bali, the Bahamas, the Maldives, or any similar destination are never a bad choice, as their outstanding beaches that feature white sand and crystal clear turquoise waters are really breathtaking. However, if you want an element of surprise to your wedding day, you can always elope and get married far from everyone. Similarly to white wedding gowns, taking regular wedding videos has become quite outdated for one simple reason – there are so many technological improvements these days which makes those ordinary videos look too simple and not special at all. This is exactly why you should take awesome wedding videos with drones as these will maximize your venue in the best possible way, which is particularly true when it comes to picturesque locations that deserve to be recorded from every possible angle. Aerial and ascending shots, as well as fly-down and fly-over shots, are the future of wedding videos, so be sure to take them into consideration when planning your big day. Apart from being an extremely fun experience for you and your partner, your guests will be more than thrilled to see such shots, too, so give them a try and you won’t regret it! As you can see, there are a lot of amazing ways to create a memorable wedding that will sweep everybody of their feet. If you’re up for that, just be sure to stick to our tips and you certainly won’t make a mistake!